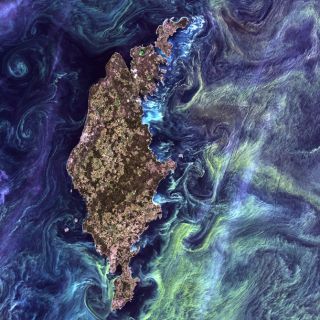 A Van Gogh-like image of blooms of plankton swirling around a small Swedish island, snapped in 2005, was the top pick. Earth's oldest continuous land-observing satellite system is turning 40, and to celebrate, the federal agencies that run the program allowed voters to pick their favorite images from a smorgasbord of dazzling shots taken over the decades. The program marked the first attempt to use satellites to peer beyond Earth's roiling clouds to the land below. NASA and the USGS asked the public to choose their favorite images from more than 120 images the Landsat Program has sent back to Earth over the years. After receiving 14,000 responses, the agencies have posted the top five winning images. Over the decades, Landsat has proved an invaluable tool, capturing large-scale images that allowed scientists and officials to monitor the creep of urban sprawl, changes in forest cover or the long-term after effects of natural disasters, to name just a few of its uses. "It was the granddaddy of them all, as far as starting the trend of repetitive, calibrated observations of the Earth at a spatial resolution where one can detect man's interaction with the environment,” Darrel Williams, the Landsat 7 project scientist, said in a statement on the NASA website dedicated to the program. This article was provided by OurAmazingPlanet, a sister site of SPACE.com. Follow OurAmazingPlanet for the latest in Earth science and exploration news on Twitter @OAPlanet. We're also on Facebook & Google+.